It's only been a week but so far the NUC is working out great. Lots of activity when the temp hits 70. 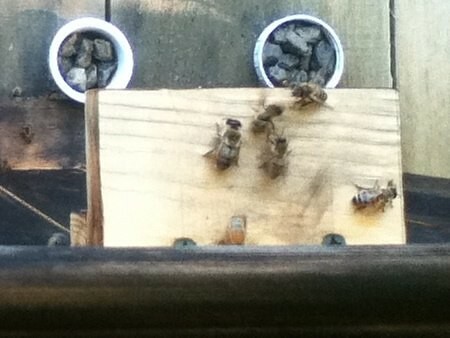 I'm seeing new comb and very few dead bees. 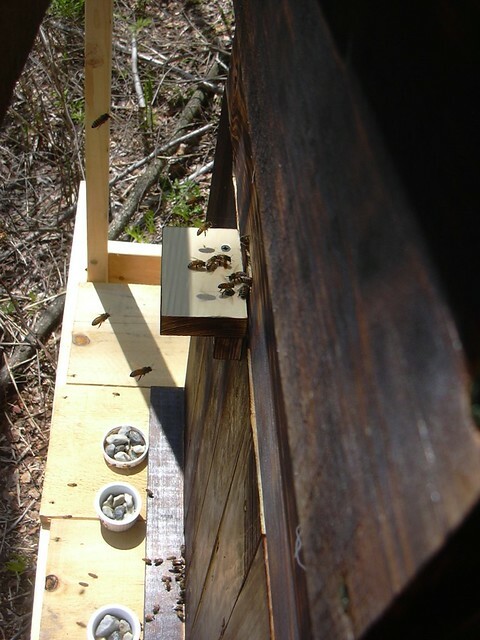 I should also add that these are local Vermont bees, though they did winter in Georgia. The beek said he relied on the Farmer's Almanac to tell him it'd be a cold winter and it was - more like the winters of 10-15 years ago. 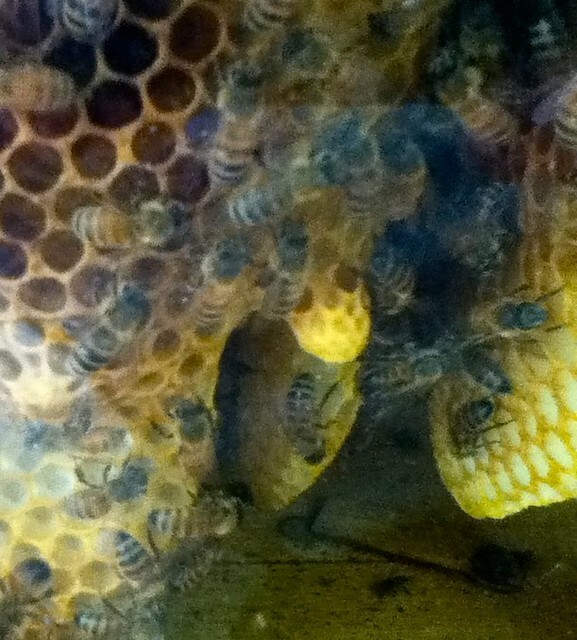 The beek also told me the queens were naturally mated. Found the guy on Craig's List. Great photos CJ they look busy building the comb. Whats the activity like going in and out the entrance? Lots of activity at both entrances when it warms up. It's still pretty cold at night, almost freezing, and it can take till 11am before it's warm enough for them to forage. I assume that's normal. Looks like old bee parts but no actual bees. At 32 days, I'd say the brood box is 20% occupied. Of the 17 bars, all but 6 have some comb. In a few weeks they should all have some comb. At that point I may give the bees access to the honey supers. Right now, their access is blocked by fabric. There was some debate about feeding a light sugar syrup. Based on my experience, with a NUC in a year with great weather, the non-interventionists won hands down. It was completely unnecessary. At day 55, about 50% filled, only 2 bars without comb. It's now really difficult to get a good photo because there are so many bees and it's dark inside. A few of the combs are just about touching the floor. The weather has been excellent! Lots more drones all of a sudden. The rest of the space is completely filled up. It's been like that since day 75 and activity has dropped quite a bit. Could be the summer dearth but there are lots of bumble bees around. Great photos, CJ! In your day 55 pic it appears that at least one comb is perpendicular to the others. I don't think that's a problem, since my first Perone colony built a cross-comb maze and got through the Winter fine. I took pics of my new Perone colony's progress on June 1, July 1, and August 1. 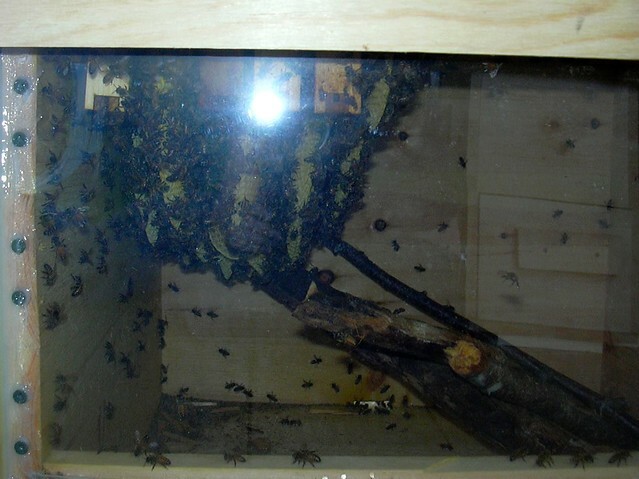 It appears that I'm not computer savvy enough to upload pics to this forum, but I've posted some pics and lots of commentary at the solarbeez site (click "Perone Hive" on the menu). Probably I'll take more pics September 1, then wait until Spring before distrubing the hive again. My bees don't like it when I open their window shutters, a fact they communicated effectively in July by stinging me good. I wore a full beekeeper suit to my August photo shoot. They stung you just because you opened the shutter to the plexiglass? Oh, I see, looking at the pic again the shutter is in the front by the entrance. I only have one around the back of the hive. I was having a lot of moisture around the plexiglass so I used some silicon to seal it up better and the condensation got worse! It eventually disappeared as they filled up the brood box though. I'm glad you were worried about the slow down of activity too. There are plenty of wild flowers around but I haven't seen too many honey bees so I don't know where they are foraging. As for the cross-comb, someone on another forum suggested this was the bees way of regulating air flow. Condensation forms where warm moisture laden air meets a cool surface. As the box fills, the window surface will warm. Sadly flowers do not equal nectar. You also need water being drawn into the flower for nectar to flow. If you are not getting much rain, the flowers may survive but will produce little nectar. If you are not getting much rain, the flowers may survive but will produce little nectar. I was shocked when my husband informed me that this was the 3rd wettest July on record! Shocked because the weather has been perfect for the bees, we've had rain but it's been mostly at night. The other thing is I've seen crazy numbers of bumblebees of at least 5 species. They certainly look like they are getting nectar off all the flowers. On the same plant there were 3 other species of bumblebees, a dragon fly and a few other bugs I couldn't ID. 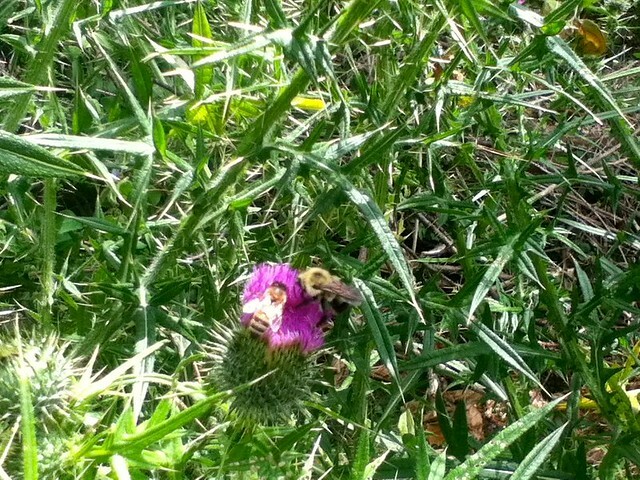 Looks like spear thistle, a bumble bee favorite. I think they produce large amounts of nectar, since the pollinators stay on them a long time. That's actually a Bull Thistle. The other day I heard a honey bee buzzing and I finally spotted it and where do you think it landed? With all the Bull thistle, Jewelweed, Smartweed, and wildflowers galore it landed on... an old cow poop! DH said, I think your honey is going to taste like sh1t, and then of course he bust out laughing. I feel like when you get your kid a great present and he spends the next 2 hours playing with the box! Yes, you will find that they forage in places you really would rather not know about sometimes! My horse's urine soaked bedding which was piled in a heap in the yard was alive with my bees last year in the autumn. 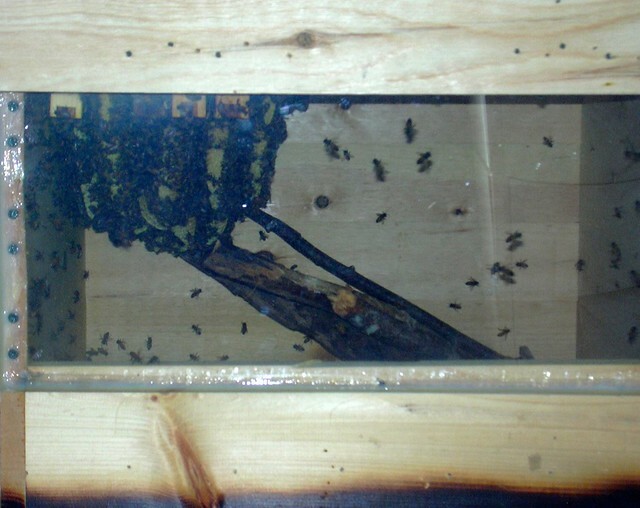 There was also a period of a few days when they were all over the waste water hopper from the bathroom despite having access to spring water and a stream closer to the hives. I was told by someone who worked at a sewage treatment plant that the filter beds there are often visited by bees... my apiary is within a mile of the plant, so it's entirely possible my girls spend time there too. The wonderful thing about creatures, that sadly we humans have all but lost, is that they instinctively know what they need to keep them healthy, be it minerals or bacteria. All man's learning has unfortunately come at the price of sacrificing our natural instincts to the point of even being repulsed when we see it in nature. In recent years, when I have seen things like that, I pause for a moment, readjust my perspective and then rejoice in how amazing nature is! Gradually the repulsion has all but faded and the wonder and joy of nature is becoming my primary response. I think it is one of the basic things that is wrong with our world and the agricultural industry in particular. Every effort is made to fight and dominate nature, but she will win in the end. Hi CJ: Bull thistle and spear thistle are the same sticker weed, called by different names in different regions. Your specimen should certainly be called "bull thistle" because it's growing in B.S.! You are lucky...most gardeners I know must purchase the B.S. they spread on their vegetables and flowers. Hi Barbara: Nectar goes into the forager bee for transport and comes back out of the bee at the hive. 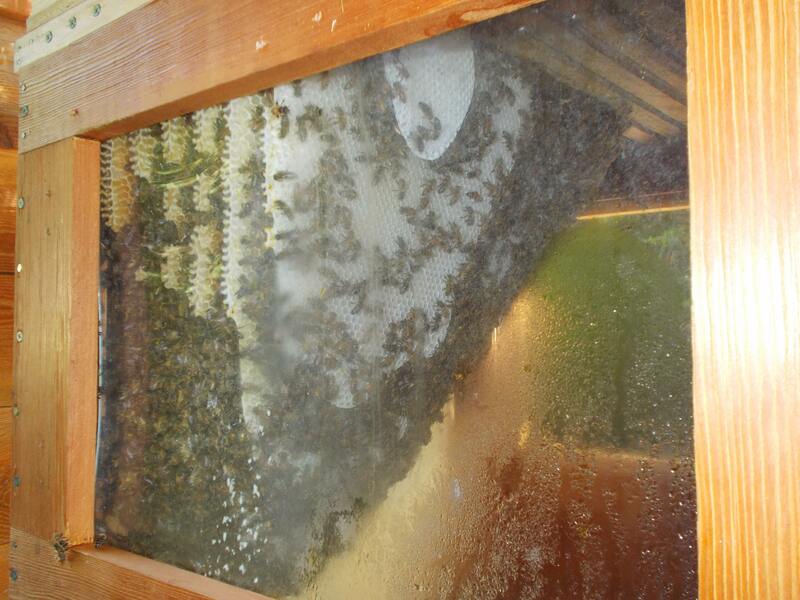 There it is processed inside other bees before being expelled and stored as honey. Delicious! And CLEAN! So, does this look like a queen cell forming? 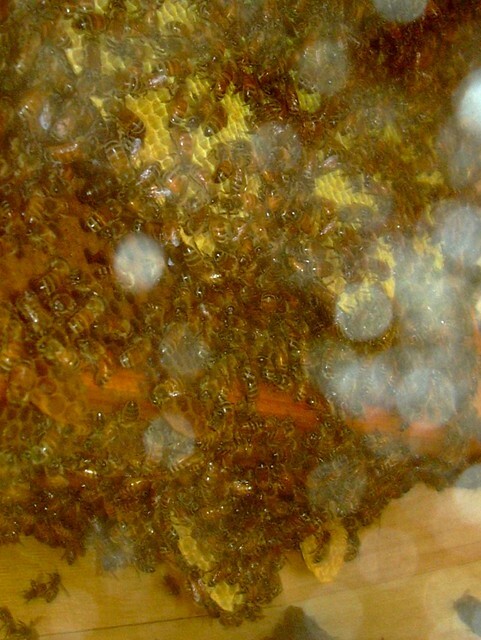 Would they really get ready to swarm at the end of September? In Vermont? More likely a supercedure cell where a queen towards the end of her life is replaced. Often there will be two queens in the colony, sometimes both laying till the old one dies. Things look bad! Population drop off has been dramatic! It doesn't look so terrible at the entrance, I even saw a yellow jacket being fought off. When I look through the window there are hardly any bees at all! 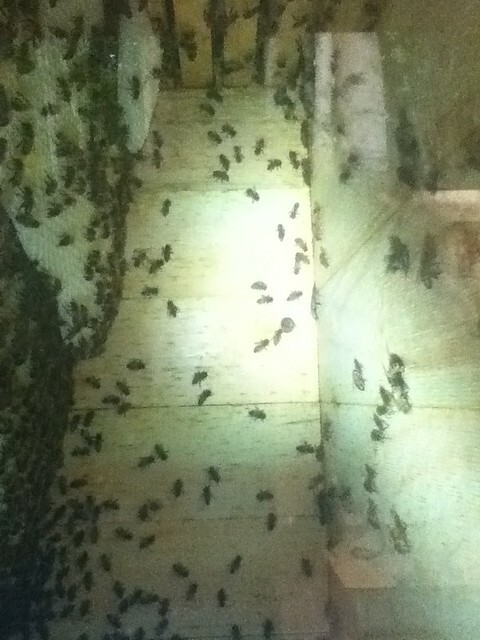 Just one or two dead bees on the floor so I don't think it's illness. 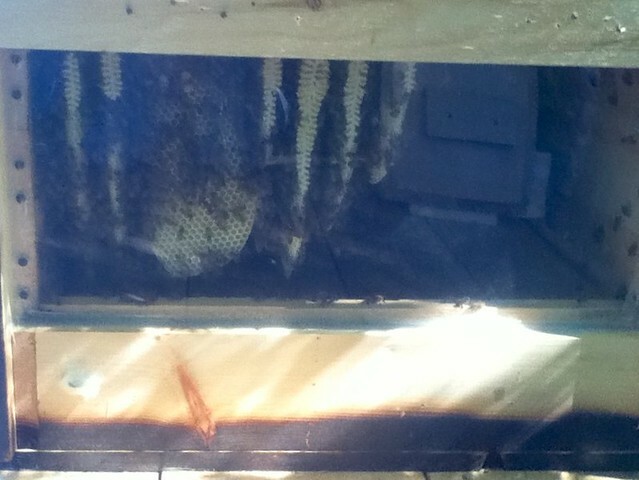 There are some between the combs but nothing like a month ago when I could barely see the combs thru all the bees. If they were able to produce a new queen how long does it take for population to go back up? Is it too late in the season for the hive to recover? Everything looked much better in the afternoon! It was a nice sunny day in the upper 60s and there was semi-decent activity at the entrance. Could've been a little pollen on the legs. I even saw a drone enter which I hope is a good sign. Looking thru the window there was also a semi-decent number of bees visible so they were definitely snuggled up in the center of the hive ready for winter this morning. Not the number of bees from a month ago but still, not terrible, I guess. So I guess they've downsized for winter. CJ, I agree that your bees have probably reduced their numbers to prepare for winter. 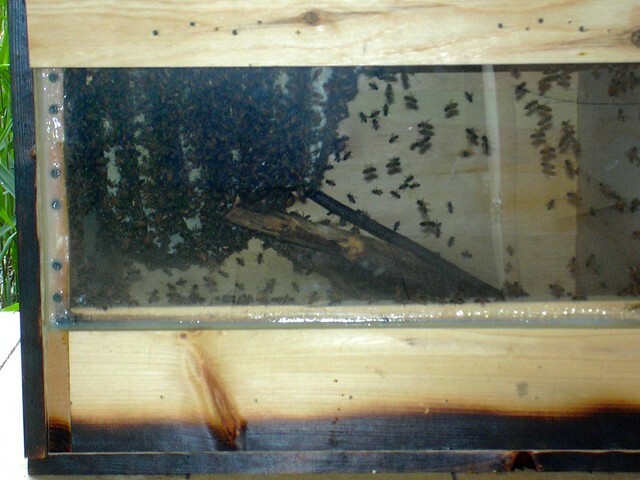 Most colony failures happen after prolonged cold weather. An exception is the Perone hive documented at thepantrybook.com, which started off very well but failed in December. The hive floor was covered with deceased bees. I think that die-off was due to a catastrophic event, probably poisoning (local governments don't usually announce when they are going to spray a neighborhood). 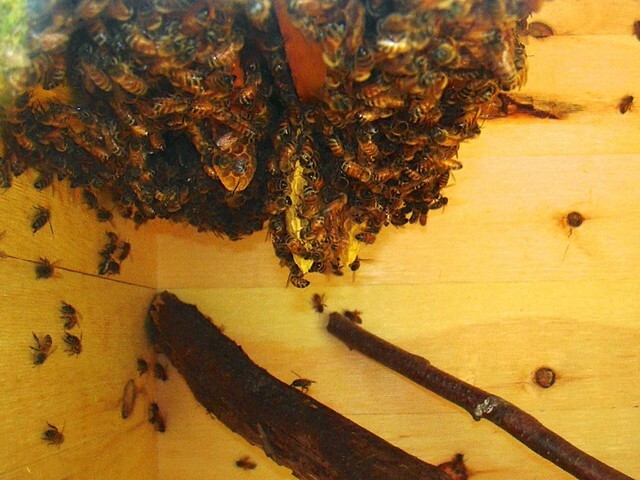 As of October 1 the populations of my 2 hives haven't decreased much, though the drones have all been expelled. Last year my bees went into winter with low numbers, then increased in population exponentially while it was still cold outside--The foragers were out in huge numbers as soon as the temperature was warm enough to fly. Thanks for all your work in this post. I am building a couple Perone hives to take to properties I have access to but wouldn't be able to visit on a regular basis so the Perone seems like the perfect solution. I will populate it with either a swarm or local bees I remove as nuisance pests. All my hives have come this way. Please keep us posted after winter and good luck.